My dad called me saying that he and his neighbor had been catching a ton of little reds in they�re back yard for days. I said �Why didn�t you call me days ago!� when I went there was allot of bait and little reds swimming around in the warm back water. They weren�t super aggressive but I managed to trigger a few to bite while my dads neighbor bob landed about 15 of them including a 26�er. Winter is still holding on. 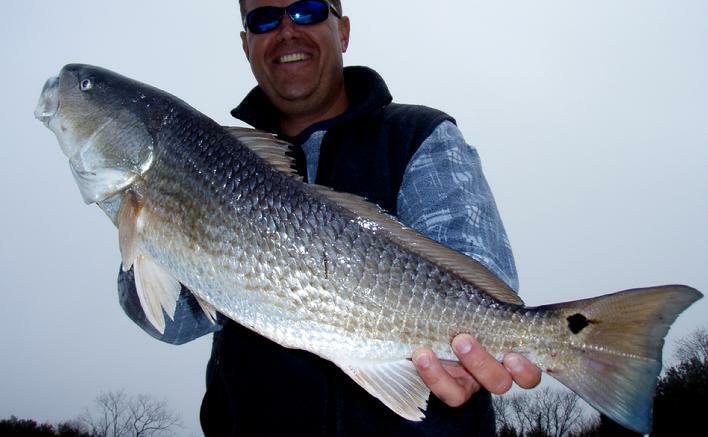 Lee with a 18" Rudee red. It warmed up and like usual, got cold. But we got out to find a bite anyway. First this week Shante, Ric and I hit the HRBT. We paddled up and down the bridge and didn�t see a fish. We bounced the bottom and didn�t get a bite. After we were over it and paddled in, Forest called to tell me he just landing a released two 30�ers. The next day, I got out of work early and Lee and I had a window between the cold front and the rain to get on Rudee and fight a few small reds. We when back the day after where Lee and Jay Kocan hooked up to some scattered small reds and I hooked grass and the bottom. Round two at HRBT this week was almost as slow as earlier. There were a dozen kayakers casting around and no one hooked up. 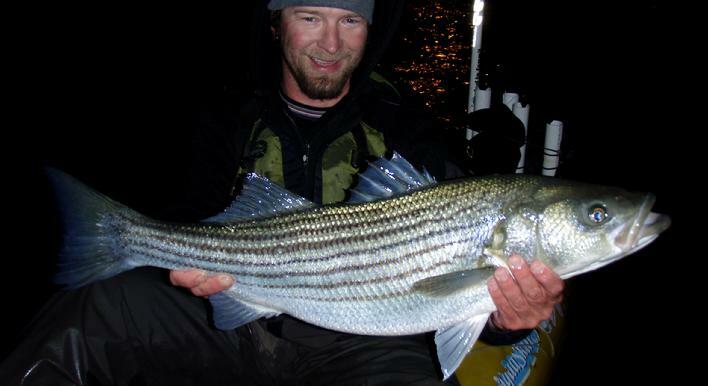 I paddled the light line to the island twice and on the way back saw only one high 20� striper. I cut back around to get into a better casting position, and he was gone. I hovered around for 15 minutes but he didn�t come back up. We were paddling back to the bridge when I saw another kayak, I told Ric, �I bet that forest and he�s fighting a 40�er right now!� we paddled up to him and it was forest! But with only a 20�er. I paddled over to Shante who was hunting on the line to get the camera and light. As I approached forest to tell him to yell if he hooks up so i can get some footage, he was hooked up again. after we left forest he landed a big�en. I enjoyed meeting and seeing everybody at the symposium on sat. i hope we all had a hand in turning some new folk on to kayak fishing. This would have been the week I left for Texas to start the �big tour� from Brownsville, paddling 3,000 miles back home. The economy crashed and all the sponsors to cut there advertising budget which cut the tour. But when one path was blocked another opened, one that I need to do at this time. The Kayak Fishing the Chesapeake Bay DVD. Forest Short has allways got one on. Ric got into the first fight. Its gotta warm up sometime. Shante, Lee and I showed up to a thin layer of ice over Rudee and the water was dark from the rain runoff a few days before. We paddled around couldn�t see anything. Shante had to leave at noon, Lee and I searched for clear water. We found the clear water and saw some specks. But they still are not biting. Id like to thank every one that came out to the Bass Pro shops spring fishing classic seminars. I always enjoy meeting fellow kayak anglers and turning new folks on to kayak fishing. Don�t forget this weekend is the symposium. I got to talk with Jon Lucy from the tagging program and got my final tag numbers from last year. It was the best tagging year in the 3 years I have been a part of the program. I was the third highest tagger with 898 total tags stuck, and third with recaptures with 85. I was second in the reds with 365. I was the top tagger with 16 sheepshead and 150 spadefish. The winds were calm as I drove back over the HRBT. I called Mike P and we went hunting for stripers in the light line. We didn�t see a single fish. I saw my buddy and light line master Harry, and he didn�t see any. We did run into a ton of menhaden, which explains the gannets I saw on the way to bass pro. I looked in my fishing log from last year during this same week and the stripers weren�t there. But next week last year is when we started catching the 30� class fish. This week was more of the same. We saw a bunch of fish slowly surface swimming trying to get some warmth. These specks are still not hungry and still not biting. Seeing them for the past few weeks and realizing after tagging some of the accidental snagged ones, some were not surviving. I want to know what�s going on with these fish and where are they going to go. This week we went with a better plan of tagging in mind. I figured the ones not surviving the landing are getting thermal shock from coming from 40 degree water to 60 degree air, and back in again, is to much for them. I brought a landing net with me. I could sneak up on a few of them, net�em, leave them in the water to tag and get a rough measurement and release them, within seconds. This worked, I saw a few throughout the day swimming around with some bling bling, sporting the orange tag out of the back look, looking good. I hope to get some returns from these fish when they do eventually turn on and eat. We hope they will turn on in there so we can get a shot at catching them before they move out and up to the Peninsula and Forest gets�em. I got a real cool tag return this week from a flounder that I tagged in Rudee in may of last year. It got recaptured last week at Folly Beach, south of Charleston, South Carolina! I got this tag return this week. Lock-jaw fish and the Salt Water Sportsman siminar. Lee and I went to Rudee again and we saw a bunch of fish but they were reluctant to bite. But I got some cool underwater shots of a cooperative black drum with the GoPro camera. When Ric mentioned I was going to be apart of the Salt Water Sportsman seminar with George Poveromo, I was excited. When George called me I asked �What kind of show do you want me to do?� Usually I do a topic and set up a slide show on it. George told me it wasn�t like a conventional seminar, its a panel format. Then I was curious. The seminar is a touring series of national instructors teaming up with the local pro�s. It was a very cool and different way to do a seminar. I thought it was very exciting, fast pace and entertaining show. The show highlight was Jimmy Price from Southport NC,(website) he told a hilarious story about the one flounder that got away, the one flounder that he has been chasing for 40 years. I had a great time sharing the stage with local greats like Capt. Craig Page,(website) Ric Burnley, and Capt. 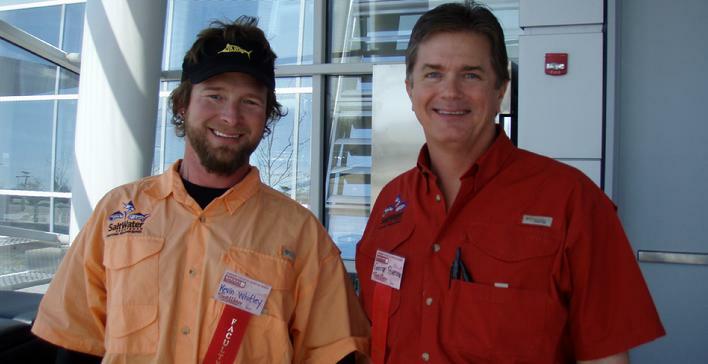 Max King,(website) and meeting Capt Jake Hiles,(website), also everyone I meet during the show. Over 300 fisherman to see the seminar. 23" tagged and released little black drum. Lee, Mike P and I hit Rudee all day in search of some biting specks. We found more slow swimming cold specks that were not hungry. We worked are way along the shore line seeing a few little reds dart out of the shallows. We started to notice one boat anchored up with the guys landing little reds on every cast. We worked our way around the edge, pushed the sterns of our kayaks into the mud and started casting across the current. The water temp in the morning was 42 degrees, on the outgoing current the temp was 49, the reds were on and we were finally catching something for the first time in three weeks. I was surprised with the water temps high the specks didn�t turn on, because they were there, right where we were casting. I accidentally snagged and tagged and released six from 20 to 26�. Lee and Mike snagged them as well including Mikes 27�er. These citation sized specks were not registered since they were not hooked while biting, which was incredibly frustrating because they were there thick. Mike even snagged a giant mullet. 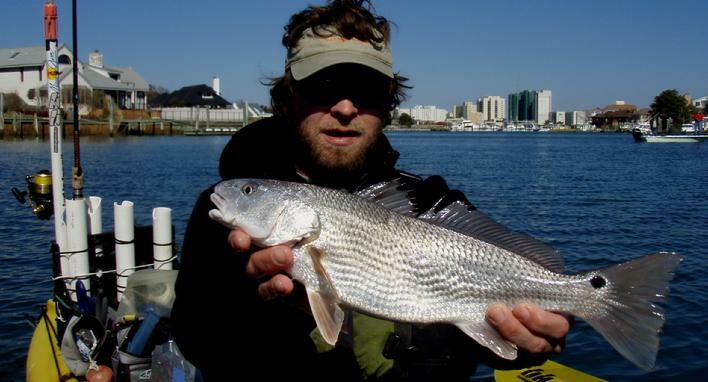 The next afternoon, I paddled way into the back in the super clear water, standing and seeing many reds, mullet, a few baby sheepshead and two baby black drum. I convinced one to bite my Gulp. I tagged him and saw him two hours later, and he didn�t what the Gulp again. Check out this weeks Weekly Video Catch for the weekly video. Mike P with a 27� accidental snagged speck. 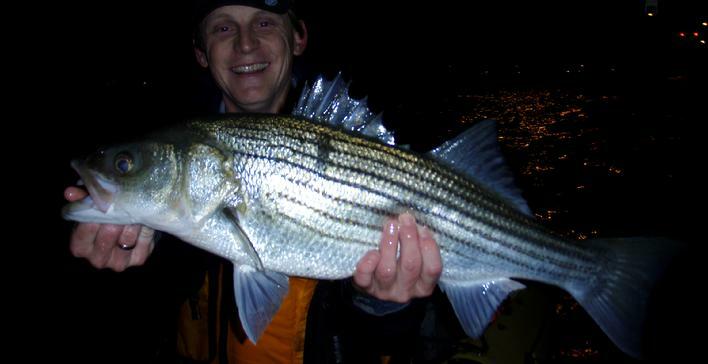 It has been so cold this week that the day it did warm up the water temp was 36 degrees, that�s pretty cold even for schoolie striper. Shante, Lee and I plugged around the HRBT island just for fun. We were casting to keep in practice and goofing off to keep our sanity, until the temps rise. This is an intensive round table discussion type seminar with 9 of the top captains and pros from the VA fishery, all lead by George Poveromo, Editor-at-large for the Salt Walter Sportsman magazine and host of �World of salt water fishing� on ESPN 2. Lee and I were planning on going to the speck spot, but when I woke up at 5am it was 27 degrees, I called Lee and wimped out on the early start and suggested we go to Rudee, after it warmed up, Lee was on the same page as I was. Shante, Lee and I hit the hot ditch this week for our early year attempt at a citation speck. We borrowed some bait from Blake and Keifer and put in our time. There were a few caught around us. Kayaker Sam caught three in a row including a release citation 26�er. Keifer caught two 26�ers. A guy fishing from the shore landed a big, big one. it looked like a 30+ incher, a possible 10lber. We caught a whole bunch of boredom. Lee and I casted around the cold 40 to 42 degree waters of Rudee. Lee hooked up to what seemed like a nice sized red, but it got into a piling and got unhooked. And that was it. Since my tour has been postponed, we are going to film allot this year. I am going to post a weekly video report along with the regular weekly catch. It will be under the Video tab, labeled Weekly Video Catch. Finding some stripers at the HRBT. We got out early in the week for some HRBT light line action. After forest�s report of 40+� striper, we had to look. Although forest doesn�t fish the line, I figured we might see one that big on the line. Shante, Ric and start cruzing the line and begin to see 20 to 22�ers. Shante asked �why aren�t we catching these?� I said �because im looking for one way bigger than these.� I paddled another sections of pilings. I was seeing 20�er, 22�er then a passed one way bigger! I cut back and lined myself up for the shot... he swam down, disappearing into the shadow. I hovered around the area for a while looking foe what I think was a high 30� class fish, but never saw it again. I was able to get the drop on a 29�er but that was the biggest one other than the one I missed. No mater the size of fish the light line was a 4 on a 0 to 5 scale lined up fairly good from bend to island. The line in these conditions is a ton of fun, its still real early for the 30+�ers in the line. But they were around. <?xml:namespace prefix = st1 ns = "urn:schemas-microsoft-com:office:smarttags" />Forest found them again the next night up to 44�. The weather keeps playing with us with south winds warming the water up then cold fronts bringing the temps back down. Shante and I hit Rudee for some small reds this week. It took a while to find them, and when we did we only found a few. The top size one was 23�, with five others in the 16 to 19� range. The water was 45 degrees. 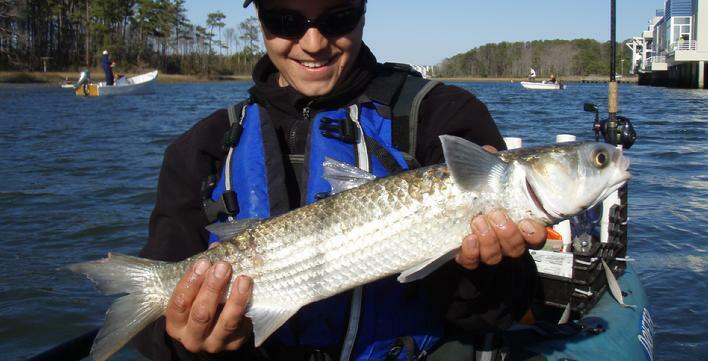 Lee and I went to the <?xml:namespace prefix = st1 ns = "urn:schemas-microsoft-com:office:smarttags" />Elizabeth river speck spot looking for our release citations and found extremely cold water that was killing our live mullets. We moved to the warmer water and caught very small specks and big crabs on cut mullet. This year I was planning on doing a BIG tour from Brownsville Texas to VA. I got some bad news from my sponsors this week. The tour is postponed until next year due to lack of funds, the bad economy has hit everyone, including the paddle sports business. This year we are going to concentrate on shooting video. Hopefully by the end of the year we will have enough footage to put together for a DVD.